Decorative shutters will improve the look of your home dramatically and that will return more than the cost when you sell the property. 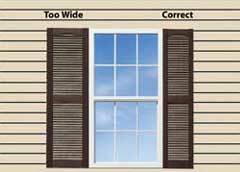 Let's figure out how to measure windows for shutters to order the perfect size of exterior shutters. Look at all the single windows first. I suggest you divide the width of the window opening in half and use that as the width of the shutter panel you would order. This dimension can be reduced by 2" without losing any of the visual effects. 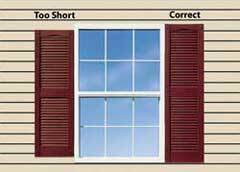 If you have very short windows where the height is less than the width, I suggest you divide the width of the window by 4 and order your shutters that width. The relationship between width and height is visually important. So making your panels narrower for those short bathroom windows and they will look appropriate. 18" or less 5-3/4" to 9-1/4"
18" to 24" 9-1/4" to 12"
24" to 36" 12" to 18"
36" to 48" 18" to 24"
48" to 60" 24" to 29-1/2"
60" to 72" 29-1/2" to 31"
The height of window shutters you should order is generally the actual height of the opening not counting the sill should you have one; however, many customers prefer to have the panels a little taller than the actual opening height. A couple of extra inches in height can be very attractive. Now for the double, triple and more windows. I suggest you divide the opening width for the double windows by 4 and use that as your panel width. You can also reduce the width by a couple of inches here, and it will look just fine. If the width is close to what you've already chosen for your single windows, use the same width for consistency; the exception being those short windows we discussed earlier. 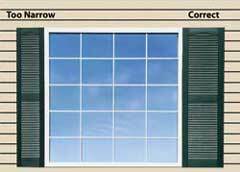 Triple windows should have the width divided by 6 for an appropriate width to order. Now having said all of this, it's your castle; and you may have a different thought on how the shutters should look. That's OK.
Arches are a great compliment to a window or door adding an architectural accent that enhances the value of a property in a big way. Arched shutters increase the accent value by completing the look of your arched openings. Measuring openings are simple and the following guidelines will be helpful as you are finishing the exterior look of your home. The most important factor in measuring is the height. Arched openings need to be measured at the center of the top to the bottom. Shutter height decisions will be based on this measurement. I recommend you order your shutters at least as tall as the opening and a couple of extra inches would be helpful. If you have trim around the opening that follows the curve of your arch I encourage you to add the width of the trim to the opening height dimension. 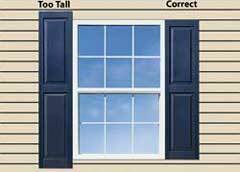 For example, if your opening measurement is 80” and your trim is 4” wide order your shutters 84” high. When you install the shutters split the height of your shutters between the top and bottom trims. If you are ordering an optional arch to add onto the top of a shutter panel you will need to subtract the height of arch from the overall finished height you desire. IE. If you want an 84” finished arch panel and the arch alone is 14” then you will need a 70” panel to make the finished shutter arch combination 84”. The Rigid Select vinyl shutters remove the guesswork. They are available as an integrated arch one-piece panel. So you would order 84” height as used in the previous example.